Badlands Motor Speedway in South Dakota. 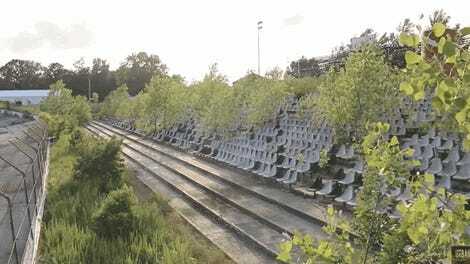 America’s short tracks have long been plagued by closures, with small, defunct ovals scattered across Google Maps, some captured in time before developers’ bulldozers took them out and others slowly succumbing to the growing weeds. But Badlands Motor Speedway in South Dakota is a bizarre case all around. 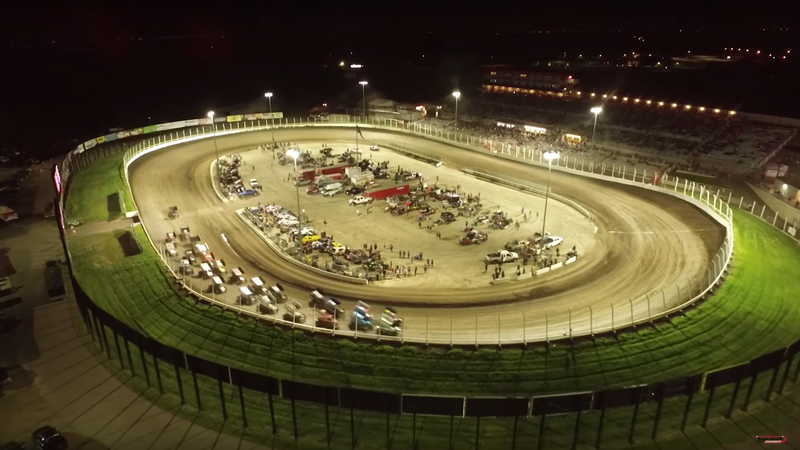 Amongst the short tracks that try, fail, and sometimes try again, the three-eighths-mile Badlands dirt track is an odd situation: Its owner said told local outlet the Argus Leader if no one buys the track from him by noon on Dec. 31, he’ll bring in bulldozers himself for tax purposes. That’s just the beginning. Badlands opened in 1954 as Huset’s Speedway, with the Argus Leader writing that it hosted local, regional and national touring races like the USAC National Midget Series and World of Outlaws. According to the story, NASCAR drivers Tony Stewart, Kyle Larson and Kasey Kahne have all raced there. The outlet reports that the owner of a payday loan company called Dollar Loan Center, Chuck Brennan, bought the 64-year-old track in 2015 and renamed it, pouring money into a renovation that, in the YouTube video advertising its sale, makes the entire track look brand new and incredibly upscale. But the Badlands Motor Speedway website is now a giant countdown clock to its potential year-end demise, about 86 days away. The entire website is now about the potential sale and what’s gone on since the track went on the market, with a section on how things got here, the list price, the math behind that price and what will happen if the countdown hits zero and there are still zero buyers. The track is for sale for just under $6.3 million, according to the website, and will go to the first person or people to bring the money. If no one brings it by the deadline, everything will be torn down and the land the track has been on for six decades will become a wildlife sanctuary. We have spent approximately $15,750,000 on Badlands [...] from the original purchase of the track to the complete remodel, buildings, labor, infrastructure and fixed assets. By shutting down the entity completely, discontinuing operations, and returning the facility to what would equate to a wildlife sanctuary, we can realize a full loss of all of those dollars spent for tax purposes. At the tax bracket/rate of 40%, by permanent discontinuance we will be able to realize an actual cash amount of $6,300,000 this year. [...] So we have priced the facility $1.00 less than that amount if someone would like to purchase it. The Argus Leader reports that the track has been on the market for almost two years, but things haven’t gone well for a number of reasons. Brennan bought the track, did the remodel and got things going, but, according to an Argus Leader story from this July, things went downhill about a year after the purchase. But South Dakota voters approved an initiative in November 2016 to cap interest rates on Brennan’s payday lending company, Dollar Loan Center. Brennan said the vote forced him to close his Dollar Loan Center facilities in South Dakota, which meant the closure of all of his Badlands entertainment properties, including the race track in Brandon. Brennan kept the track open in 2017 but closed it after only one race, the 2nd Annual $100,000 Silver Shootout on May 13. In addition to some telling the Argus Leader the current list price is too high, a failed auction earlier this year also postponed any track purchases. If the track does get torn down, the Badlands website says its team will go after Minnehaha County in South Dakota “to aggressively approach any and all legal remedies that may be available [...] from the reckless action” Badlands’ team claims the county made made before that failed auction. Actions by Minnehaha County officials this summer scared away potential buyers, Brennan said. County officials said in June the old Huset’s track was going to lose a grandfathered-in exemption to the county’s zoning rules. They rescinded the notice a month later. “That this county can come in and say, ‘you can’t race,’ it’s caused the sale to go sideways three times now,” Brennan said. The Badlands website says that since the auction, its team has gotten quotes to remove and recycle the virtually brand new buildings, bleachers, tracks and other parts of the facility. If no one comes forward to buy the track by Dec. 31, the track won’t be around anymore. What a strange, strange way to go out.